Tagline: Put an atheist in a strict Catholic school? Expect comedy, chaos, and an Inquisition. The Breakfast Club meets Saved! in debut author Katie Henry’s hilarious novel about a band of misfits who set out to challenge their school, one nun at a time. Perfect for fans of Becky Albertalli and Robyn Schneider. 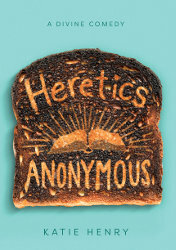 About HERETICS ANONYMOUS: When Michael walks through the doors of Catholic school, things can’t get much worse. His dad has just made the family move again, and Michael needs a friend. When a girl challenges their teacher in class, Michael thinks he might have found one, and a fellow atheist at that. Only this girl, Lucy, isn’t just Catholic…she wants to be a priest.